Jesus taught that in the new economy, God would seek true worshippers who would worship in spirit and truth: “God is spirit, and his worshipers must worship in spirit and in truth” (John 4:24). The purpose of worship is to drive out the worldly and to think of the “other world.” Hence, worship must be driven by faith, and faith is founded in the truth of God’s word (John 17:17). In one of the great scriptures commanding singing in worship to God, Paul taught that singing is an individual as well as a collective act: “Speak to one another with psalms, hymns and spiritual songs. Sing and make music in your heart to the Lord” (Ephesians 5:19). 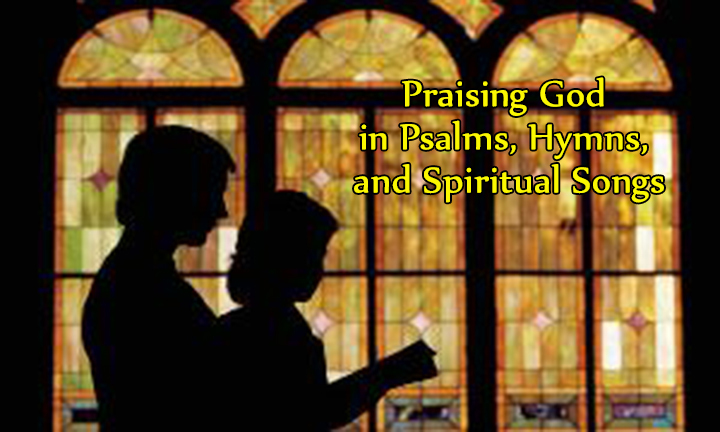 The command to “speak to one another with psalms, hymns and spiritual songs,” is a reciprocal action of each worshipper. Singing in worship to God is unique in that every worshipper in the same manner and the same time can pour out the heart in praise to the Almighty. Whether we are excellent or average or poor as a singer, in the sight of God what counts is that it comes from the heart: “Sing and make music in your heart” (Ephesians 5:19). Remember there are different kinds of worship, some acceptable to God and some that are not. First, God rejects and does not accept “ignorant” worship (Acts 17:23, 30). God does not receive worship that is issuing from the heart of the “will-worshipper,” who is only doing what pleases him instead of the Creator (Colossians 2:20-23). Neither is God happy with worship that is based on “the traditions of men” and “the creeds of men.” This kind of worship is styled in the scriptures as “hypocrisy” and “vain worship”—empty and worthless (Matthew 15:7-9). The only other type of worship left is true worship in spirit and truth. In the area of music we worship in “singing and making melody in the heart to the Lord” (Ephesians 5:19). Or as Paul expresses it to the Corinthian congregation: “So what shall I do? I will pray with my spirit, but I will also pray with my mind; I will sing with my spirit, but I will also sing with my mind. If you are praising God with your spirit, how can one who finds himself among those who do not understand say “Amen” to your thanksgiving, since he does not know what you are saying”(1 Corinthians 14:15-16)? Thoughtful worshippers of God, let us pray and sing and praise God with the understanding of our mind and spirit.